There's no denying that the first snowfall in Minneapolis and St. Paul is beautiful, but the novelty wears off quickly when you have to shovel and plow it for months on end. Not only is this chore time-consuming, it can also be hard on your back and knees. Ignoring the snow won't make it go away, at least not until springtime. It also could keep you stuck indoors, which your boss might not appreciate. If you're the boss, keeping your property free of snow and ice is essential to prevent someone from sustaining an injury. When there's a break in the snowfall, make sure that you have a sturdy, ergonomically designed shovel and head out to the driveway. A plastic shovel is less apt to freeze than a metal one, although shovels made of aluminum are the most durable. To avoid injury, push the snow across the driveway until it is out of your path. Avoid lifting the heavy snow so you don't become over-exerted. If you must lift the snow, be sure to bend at the knees before doing so. It's also important to dress appropriately for the weather and take frequent hydration breaks. For a large dumping of snow, it's best to use a snowplow if you have one. You can attach a plow to the front of a heavy-duty truck or purchase a separate unit. For the sake of efficiency, plan to drive a bit slower when the snow is compacted, wet, or extremely thick. This allows the blade to go deeper into the snow. It's essential that you understand how to operate the plow safely before attempting to use it for the first time to avoid serious injury or even death. Additionally, you need to budget several thousand dollars if you want to buy a snowplow of your own. At The Lawnsmith, we don't shut down for the winter. 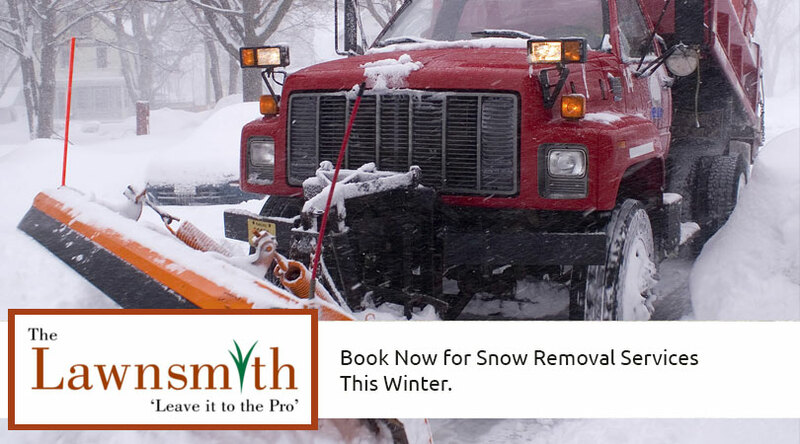 We're available all season long to help residential and commercial clients with their snow removal needs. You can request monthly or per-incident snow plowing services as well as snow removal packages based on the amount of snowfall. Even though it's only October, our available openings fill up fast. If you would rather enjoy hot chocolate and winter sports than shovel snow, don't hesitate to reserve your spot today.